Shortly before 9 a.m., the vehicle, which appears to be a large truck, burst into flames near Pine Canyon Road. The blaze spread into nearby vegetation and burned about a half acre. Firefighters managed to quickly stop the progress of the blaze. 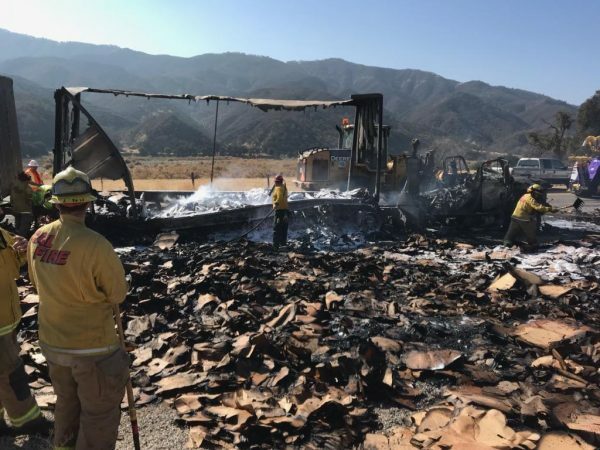 Personnel from several local firefighting agencies contributed to the firefight, and both fire engines and aircraft were called out to the scene. It is unclear what caused the vehicle to catch fire. Crews are continuing to work on Highway 166, as of Monday afternoon. Authorities are warning drivers to exercise caution when traveling on Highway 166 between highways 101 and 33.